For abstracts from Asian societies, each Society please provides the list of abstracts and the abstracts to the organizer on the due course. For individual abstracts from non-Asian regions, please submit via the conf. website, status of the author will be verified by the organizer through ISSMGE Secretary Office. For TC/ATC session host, please provide the list of abstracts and the abstracts to the organizer on the due course. The deadline for TC/ATC abstracts can be extended to 2018.05.31 upon the sorted information of abstracts provided by organizer. ABSTRACT template will be available on 16ARC website. 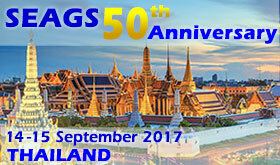 Abstract Acceptance – 2018.06.30Notice for acceptance of the abstracts will be announced by 16ARC organizer to Asian societies/individuals at other regions/TC&ATCs. For Asian societies, all the papers need to be collected and submitted through society office. For individual papers at non-Asian regions, please submit via the conf. website, status of the author will be verified by the organizer through ISSMGE Secretary Office. For TC/ATC session host, please help to collect the papers through committee secretary. Full-paper template will be available on 16ARC website. For Asian societies, please help to make the reviews/revisions at your society. The accepted papers are to be submitted through society office with a confirmed list. For individual papers from non-Asian regions, the organizer will make the reviews. For TC/ATC session host, please help to make the reviews/revisions before submitting the final papers. Final paper received – 2019.01.31All the final papers should be received by 16ARC organizer upon the due date. Notice of oral/poster presentation after overview – 2019.04.30TC/ATC session papers (oral presentation) will be noted by 16ARC organizer via the helps of TC/ATC officers. Other papers will be notice by 16ARC organizer.